Monster Hunter: World offers new limited-time quests every week. Some of these involve brawling tons of monsters, while other feature giant versions of familiar beasts. But the best quest so far is one of the most straightforward. 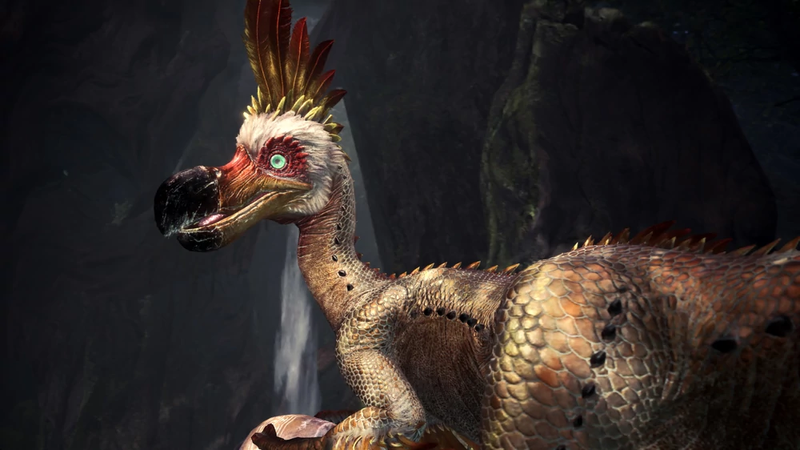 “Ya-Ku With That?” is one of the most common event quests in Monster Hunter: World, repeating three times in the nine total weeks of event quests. It’s a low level quest that requires a hunter rank of six and tasks the player with defeating two monsters in 50 minutes. One is the large, dodo bird-esque Kulu-Ya-Ku, while the other is the bright flash-emitting Tzitzi-Ya-Ku. They are encountered early in the game, and while they aren’t difficult monsters to defeat, the combination makes for a brisk and exciting encounter that’s one of my favorites. Much of this has to do with the Tzitzi-Ya-Ku’s ability to flash a bright light in the player’s face and disorient them for a time. The Tzitzi-Ya-Ku leaps back, rears its head, and emits a camera flash-like burst of white light, along with a piercing noise that stuns anything in front of it. The trick is to rush behind the monster to avoid getting blinded and sneak in some free hits. The Tzitzi-Ya-Ku’s ability is tricky by itself, but it takes on a new level of danger as the player tries to dodge the speedy Kulu-Ya-Ku. 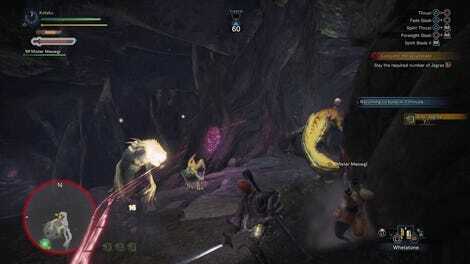 Monster Hunter: World event quests mostly fall into one of two categories: fighting against numerous monsters at once or fighting some type of giant version of a dangerous monster. The latter quest is a favorite for crossover events. Unlocking a skin to play as Street Fighter’s Ryu involved battling a massive barroth, a sort of hard shelled crab lizard that was already very large to begin with. The quest to unlock Horizon Zero Dawn’s Aloy involved battling a larger than normal Anjanath. While these were challenging fights, I never felt like I had to do anything other that hit the big monster with my sharp weapon. Quests managing multiple monsters such as “Ya-Ku With That?” demand greater awareness of my surrounding and provide a much more satisfying experience, even if they are lower level. Tracking multiple monsters and dodging between their attacks using my dual blades’ highly mobile attacks is a much greater test of my game sense and awareness than smacking a slightly bigger T-Rex. Of course, it is possible to have too much of a good thing. A week seven quest called “A Flash In The Pan” dumped players into an arena with three Tzitzi-Ya-Ku. Having three crazy lizards blasting bright lights in your face made for a clumsier fight, particularly if you were playing solo. Week Three’s “Wicked Wildspire Warfare” featured two barroth and a diablos, monsters with strong armor that deflects weapons and a sheer size that makes positioning difficult. Surpassing these challenges often felt more like a process of brute force than technical prowess. A good quests strike a balance between monster difficulty and numbers, finding monster combinations that complement each other. What makes “Ya-Ku With That?” work is its restraint. There are no super-sized monsters or overwhelming numbers. It’s a small flash of monster-hunting action that hits all the things I love about the game. I’m glad there are tougher quests and high tier rewards, but I also hope the game continues to find time for simpler events.